Unplanned downtime costs food producers anything from hundreds of pounds an hour to tens of thousands, depending on the process. In the production of food and bev, smart condition monitoring cuts downtime by anticipating device failure. For example, if a mixer unit fails in a processing plant the drop in productivity can cost thousands of pounds per hour. In addition, there is the cost of wastage and unplanned maintenance. This is often due to unexpected equipment failure, and Mitsubishi Electric has introduced a new product to address this. Predictive maintenance using a Smart Condition Monitoring (SCM) system gives operators a window to their machinery status. The system can raise an alarm, predict failures in advance and provide information on recommended actions to take, all allowing for more cost-effective asset management. This is particularly important to avoid unplanned production downtime events and the associated excess maintenance costs. Advanced condition monitoring in F&B relies primarily on developments in sensor functionality, networking and smart controllers to provide continuous monitoring. For information, the system utilises multiple smart sensors, physically attached to the assets. 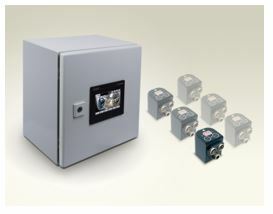 These allow the SCM to automatically monitor a wide range of parameters and feedback information via Ethernet to a controller in the Mitsubishi PLC. Furthermore, it alerts the operator by sending warnings to multiple devices, including, the operator’s HMI; signal tower; SMS; or Wi-Fi. It is suitable as a self-contained, stand-alone device for feasibility studies or trials, or as a fully integrated system. This makes it a scalable and cost-effective solution for a wide range of installations. Once in operation, a Advanced Condition Monitoring system can detect a wide range of potential issues. These include bearing defects from races or balls and rollers, motor imbalance, misalignment, instability, resonant frequencies, breakages, blockages and low levels of lubricant, temperature fluctuations and phase failure in power components. The system can also offer suggestions for future operation. This enables more precise error identification and trend analysis. Further, by distributing sensors around the plant extends the reach of the SCM beyond concentrating on specific power transmission components. It becomes economical to connect many smaller ancillary systems, bringing a more encompassing view of the production facility itself.